A number of BayBrazil partners and members travel often to Brazil to participate in events, visit local clients and deepen their ties with the local tech community. Jackie Hyland, Silicon Valley Bank’s Director for Latin America, wrote this article for BayBrazil on her recent trip to São Paulo and Rio de Janeiro. Last week, Andy Tsao and I took our first trip to Brazil of 2017. We started off the trip in Sao Paulo, visiting a few startups and investors to get a pulse on how clients, friends, and local players were feeling about the upcoming year. Overall, the good news is startups and their investors are feeling positive. This year started off with bang for Brazil with the announcements fundraises of 99 Taxis, Creditas, and Nubank, totaling ~$205 million dollars. With the entrance of Didi Chuxing into Brazil and other players already in the market such as Baidu, there’s a high possibility we will start to see more dollars flowing from Asia into Brazil this year. Last year, Chinese companies have spent $11.9b acquiring mostly non-tech Brazilian counterparts, but we expect more of these funds to start to flow into technology in 2017. The fintech industry is still going strong – we visited Guiabolso, Nubank, and the new offices of Creditas, as well as new players in the invoice financing space, Adianta and Dunas Plus. We also had the chance to visit logistic companies such as Mandae and CargoX, both of which have been growing immensely due to the overwhelming need for more competitive e-commerce and freight logistics in Brazil. Investors are raising capital, albeit not as easy as in previous years given the residue of the “Lava Jato” and the Brazilian economic depression. That being said, there were several new seed stage investment funds that got started last year, Canary VC, Grids Capital, Barn Investments, and Indicator Capital which shows a positive interest in early stage financing. More players in the earlier space helps form pipeline, but there’s still a local fundraise gap at the Series B and C players. Before heading back to San Francisco, we attended the exciting 70th Endeavor International Selection Panel in Rio de Janeiro where we had the privilege of being panelists and see Brazilian companies like Hi Tecnologies, Gesto, and Brisanet become endeavor entrepreneurs. 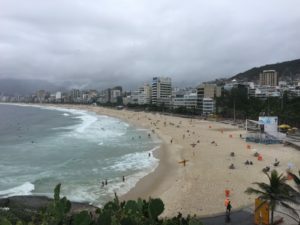 Rio de Janeiro has been hit harder than other cities during the Brazilian economic crisis, nevertheless, there are a handful of very active startups active in the city such as PSafe, Descomplica, Nibo, Volanty, BizBank, Winnin, Valuenet, and Nuuvem. During our trip, Rio based journalist Vinod Sreeharsha published an article in the NY Times about IPOs in Brazil for this year. Among them, Brazilian e-commerce company Netshoes which filed with the Securities and Exchange Commission last week to be listed on the New York Stock Exchange. Director of Investment Banking of Itau estimates a total of 10-15 IPOs this year. As the article states, people are “cautiously optimistic,” but this year looks like it’s going to be a step in the right direction for the Brazilian technology economy. We certainly agree that an IPO for a venture backed company would be a very positive milestone for Brazil’s innovation ecosystem.